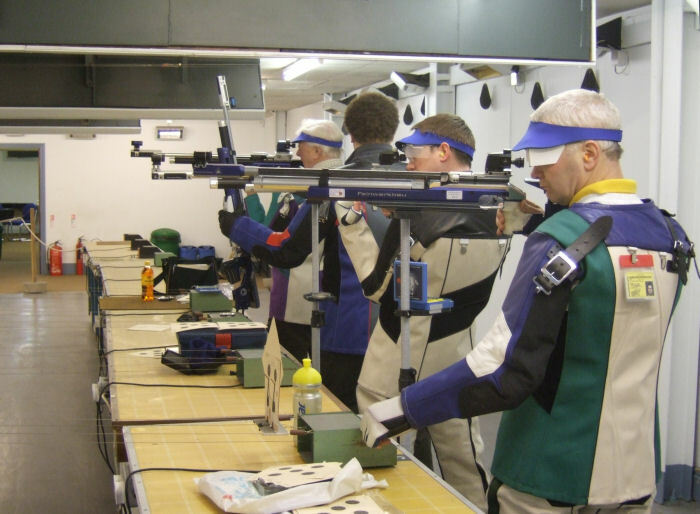 A group of air rifle shooters on the 10 metre range showing both the right kind of stance and the right kind of equipment to do well at this most exacting and demanding of the standing shooting disciplines. This is an Olympic sport and in the final, each shot is scored to 1/10th of a point. The maximum possible score is 600 in the main event plus 109 in the final (made up of an additional 10 shots, each with a maximum value of 10.9). To date neither maximum has ever been achieved under competition conditions; do you think that you could do it? The person nearest to the camera is using a stand to rest his rifle on whilst operating the target changing mechanism.